Subsidizing clean energy will cut carbon, but not as much as a robust carbon tax. Many believe that devoting tax revenues to support, commercialize and bring down the price of clean energy will enable the U.S. and other societies to transition quickly and massively from fossil fuels. “No carbon tax needed,” according to this scenario; wind, solar and other renewables will out-compete fossil fuels in energy markets once they’ve been granted appropriate price supports to overcome initial hurdles to commercialization. This idea has strong elements of truth. But we regard as wishful thinking the idea that subsidizing down the cost of clean energy can do more to push out fossil fuels than raising those fuels’ market prices through carbon taxing. In broad terms, our view is that human appetites for energy are so boundless that, absent robust prices on carbon emissions, energy demand will outstrip the potential of even optimized and advanced solar and wind power systems. More analytically, in comments submitted to the Senate Finance Committee in 2014, we demonstrated that even a perfectly designed U.S. energy subsidy program — one that dismantled fossil fuel subsidies while buying down the price of renewable power and fuels — couldn’t compare in effectiveness to a carbon tax. Ending direct subsidies to fossil fuels, while long overdue, won’t solve the climate crisis. A related construct is that fossil fuels are massively subsidized — so much so that subsidies are the sole reason that coal, oil and gas still dominate energy supply at the expense of efficiency, wind and solar. According to this view, eliminating these subsidies — which ought to be easier politically than enacting a robust carbon tax — should take center stage in efforts to reform energy pricing and markets. Alas, this too is a false promise. In the United States, direct governmental support of fossil fuel exploration and production appears to be “only” around $22 billion a year. While that is no small amount, it translates to a mere few percent of “end user” expenditures on fossil fuels; accordingly, taking away the $22 billion largess, though a financial blow to the fossil fuel industry, would trigger only a few percent rise in fossil fuel prices — not nearly enough to fundamentally alter the market equations that still favor fossil fuels over renewables in much of the energy sector. The clearest and most comprehensive worldwide examination of fossil fuel subsidies is a 2015 report by the International Monetary Fund documenting energy subsidies and externalities worldwide. The report broadened the conventional definition of monetary “subsidies” to include fossil fuels’ massive externality costs — impacts on human health and climate — along with government spending to prop up their fossil fuel sectors. 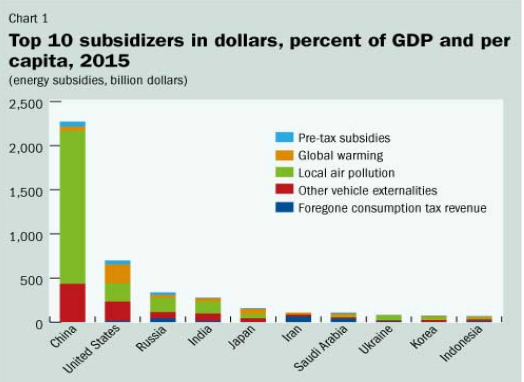 The IMF graphic conveys at a glance that the absence of a charge for the harms those fuels engender when burned is a far greater factor in suppressing fossil fuels’ market prices than do taxpayer-funded subsidies. The remedy — the means to charge for those harms — is, of course, an explicit carbon tax.